'Edgefield Glow' (Schreiner, R. 2011). Seedling RR-612-1. TB, 36 (91 cm), Early midseason bloom. 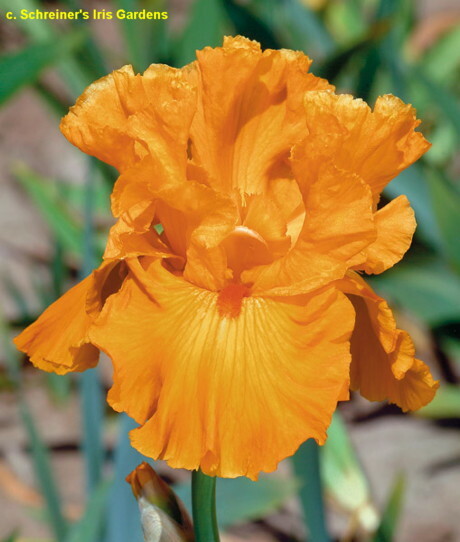 Standards, style arms and Falls orange (RHS 25A); beards tangerine; S-curved stalk. Seedling MM 811-1: (seedling CC 958-A, pollen parent of 'My Oh My', x 'Mogul') X 'Good Show'. Schreiner 2011.
jpg EdgefieldGlow1.jpg manage 103 K 11 Sep 2018 - 02:28 Main.TLaurin Photo by South Jersey Iris.